Interstate 65 (I-65) is a major Interstate Highway in the central United States. As with most interstates that end in a five, it is a major cross-country, north-south route, connecting the Gulf of Mexico to the Great Lakes. Its southern terminus is located at an interchange with I-10 in Mobile, Alabama, and its northern terminus is at an interchange with I-90, U.S. Route 12 (US 12), and U.S. Route 20 (the Dunes Highway) in Gary, Indiana, just southeast of Chicago. I-65 connects several major metropolitan areas in the Midwest and Southern United States. It connects the four largest cities in Alabama: Mobile, Montgomery, Birmingham, and Huntsville. It also serves as one of the main north–south routes through Nashville, Tennessee; Louisville, Kentucky and Indianapolis, Indiana; each a major metropolitan area in each respective state. In the state of Alabama, I-65 passes through or near four of the state's major metropolitan areas: Mobile, Montgomery, Birmingham, and Huntsville. I-65 begins its path northward in Mobile at its junction with I-10. From I-10, I-65 runs west of downtown Mobile and through the northern suburbs of the city before turning northeasterly towards Montgomery. In Montgomery, I-65 connects with the southern terminus of I-85. In Birmingham, I-65 has an interchange with I-20/I-59. North of downtown, I-22 branches off I-65 towards Memphis. From Birmingham, I-65 continues north, crossing the Tennessee River near Decatur. A few miles north of the river, it interchanges with I-565, a short spur route which provides access to Huntsville. It then continues northwards out of the Tennessee Valley to the state of Tennessee, towards Nashville. Interstate 65 southbound in Nashville. I-65 enters Tennessee from the south near the town of Ardmore and passes through mostly rural territory for 65 miles (105 km). It then passes Lewisburg. Then it reaches the outer parts of Columbia and making its way to Saturn Parkway, which brings travelers to the town of Spring Hill. I-65 then continues on to reach I-840 and progresses until it intersects SR 96 at Franklin. Then the highway goes through Brentwood, Nashville, Madison, Goodlettsville, White House, and then close to Portland, this highway passes into the state of Kentucky. Interstate 65 northbound at the former William H. Natcher Parkway (now Interstate 165) in Bowling Green, Kentucky, 2007. I-65 enters the state five miles (8.0 km) south of Franklin. Throughout its length, it passes near Mammoth Cave National Park, Bernheim Forest, the National Corvette Museum and the Fort Knox Military Reservation. The first major intersection in the state is with I-165 at Bowling Green. I-65 has intersections with three of the parkways in the state. The first major junction is with the Cumberland Parkway near Rocky Hill. At Elizabethtown, it has two more parkway interchanges with the Wendell H. Ford Western Kentucky Parkway and the Martha Layne Collins Bluegrass Parkway. I-65 also has interchanges with I-265, I-264, I-64, and I-71. 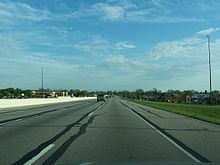 The widest stretch of Interstate 65 in its entirety is in Louisville at Kentucky Route 1065 (KY 1065, Outer Loop), where the main line is 14 lanes wide. The highway crosses the Ohio River into Indiana on the John F. Kennedy Memorial Bridge (southbound) and Abraham Lincoln Bridge (northbound). The latter bridge opened in October 2016 as part of the Ohio River Bridges Project. Prior to the project, the Kennedy Bridge (completed in 1963) carried traffic in both directions. The project also included reconstruction of the I-65/I-64/I-71 convergence interchange just south of the Kennedy Bridge, plus renovating the older span to carry six lanes of southbound traffic. Additionally, a second six-lane cable-stayed bridge 12 miles (19 km) upstream on the Ohio, the Lewis and Clark Bridge, was built as part of the project, opening in December 2016 to complete the I-265 loop around Louisville. At one time, the stretch of I-65 from Louisville to Elizabethtown was a toll road bearing the Kentucky Turnpike name. The bonds that financed the road have been paid off, and tolls are no longer collected. All signs of the former turnpike have been removed. On November 15, 2006, the stretch of I-65 from Bowling Green to Louisville was renamed the Abraham Lincoln Memorial Highway. On February 12, 2007, a bill passed the Kentucky Senate to rename I-65 in Jefferson County the Dr. Martin Luther King Jr. Expressway. Signs were posted July 25, 2007. On July 15, 2007, Kentucky highway officials raised its speed limits on Interstate and State Parkway highways to 70 miles per hour (110 km/h). Until that date, Kentucky was the only state along I-65's path that had a speed limit of 65 mph (105 km/h). I-65 enters Indiana at Jeffersonville and Clarksville. Miles 0–9 were rebuilt, widened and realigned from north of Sellersburg to the Ohio River during 2008–10, giving great traffic relief to the fast-growing Indiana suburbs of Louisville. Over 300,000 of the 1.5 million persons in Louisville's CMSA live in its Indiana counties. The section of I-65 in downtown Indianapolis overlaps I-70. The junctions are often referred to as the "North Split" and the "South Split", forming a section of Interstate locally known as the "Inner Loop" or "The Spaghetti Bowl" due to the visual complexity of the overlapping freeways. In mid-March 2007, a 6-mile (9.7 km) section of I-70 from the North Split to I-465 east of downtown was restricted to automobiles only for the "Super 70" project, a massive rebuild and expansion of that freeway. Trucks over 13 short tons (12 t) were forced to divert through I-65 if coming from the north and use the circular I-465 to the south to reconnect to I-70 eastbound. Westbound traffic from I-70 was required to loop north or south along I-465 to get to I-65 or I-70. The Super 70 project was completed in November 2007. In the middle of 2003, the portion of I-65 that runs concurrently with I-70 was closed to all traffic due to the "HyperFix" project. During that time, a new concrete surface was installed and the overpasses were upgraded. In 1999, the 25-mile (40 km) segment of I-65 between the two I-465 interchanges was renamed the Kenneth "Babyface" Edmonds Highway. North of Lafayette near Brookston, the road passes through the Meadow Lake Wind Farm for several miles, with the turbines and standards spaced out in order to avoid a collapse onto the highway. The Fowler Ridge Wind Farm is also visible on both sides of the highway. Upon crossing into Lake County, Indiana, over the Kankakee River, the highway is known as the Casimir Pulaski Memorial Highway. It is known as this from that point to its northern terminus. The northern terminus of Interstate 65 was only 1⁄8 mile (0.20 km) north of I-90 (Indiana Toll Road), prior to 2004. Until then, traffic going from I-90 to I-65 had to make a physical left turn onto I-65 via a traffic signal. Traffic from I-65 to I-90 bypassed the traffic signal via an isolated right-turn lane. In 2004 it was fully grade-separated, so it is now considered to be a single interchange between I-65, I-90, US 12, and US 20, thereby eliminating a connection gap in the Interstate Highway system. US 80 in Montgomery. The highways travel concurrently through Montgomery. US 80 / US 82 in Montgomery. I-65/US 82 travels concurrently to Prattville. US 31 in Smoke Rise. The highways travel concurrently through Smoke Rise. US 31 in Athens. The highways travel concurrently to Ardmore, Tennessee. I‑40 in Nashville. The highways travel concurrently through Nashville. I‑24 in Nashville. The highways travel concurrently through Nashville. US 31 in Jeffersonville. The highways travel concurrently to west of Jeffersonville. I‑70 in Indianapolis. The highways travel concurrently through Indianapolis. I‑865 / US 52 north-northwest of Royalton. I-65/US 52 travels concurrently to Lebanon. I-265, the Kentucky segment of the beltway around Metro Louisville and called the Gene Snyder Freeway. ^ a b Adderly, Kevin (January 15, 2014). "Table 1: Main Routes of the Dwight D. Eisenhower National System of Interstate and Defense Highways as of December 31, 2013". Route Log and Finder List. Federal Highway Administration. Retrieved November 30, 2014. ^ Gerth, Joseph (February 13, 2007). "Senate OKs renaming I-65 for King". The Courier-Journal. Louisville, KY.
^ Shafer, Sheldon S. (July 25, 2007). "Mayor, Democrats back I-65 King plan". The Courier-Journal. Louisville, KY. Retrieved July 30, 2007. ^ "Super 70". in.gov. Archived from the original on October 29, 2007.